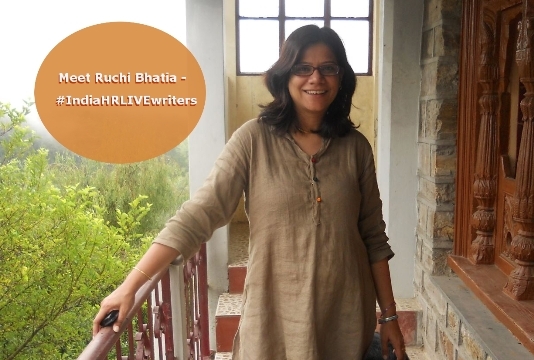 Today, as we celebrate our first anniversary #IndiaHRLIVEYear1 we are glad to welcome our newbie Ruchi Bhatia to the team. Ok, you must have seen this face on Social Media, but let’s get to know the person a little bit! What makes you who you are as a person. Humbling experiences in Life & work makes me who I am. An avid reader, compulsive writer, driven by strong values and passion & curiosity. Fill us in your title, company and what you do for a living. Recruitment Branding Lead, (Trusted Business Advisor) at IBM India . I am HR Consultant, love to integrate People, Process, and Technology for a living. I consider myself A Lifelong learner & student of HR. I love to evangelize & work on social media adoption across the enterprise. Social media adoption plays a key role in every aspect of Talent Management – Talent Acqusition, Talent Development ,Talent Engagement & Retention . Being one of the early adopters of Social media and emerging Web 2.0 technologies, the journey has been an enriching one with initial successes and lots of challenges. Enough of the serious stuff! Let’s move to something fun & personal about you! What are your favorite movies and why! A Beautiful Mind for it is based on moving & true life story of John Nash . Movie depicts amazingly brilliant and his tragic life battle with schizophrenia. John Nash emerges as a strong & intelligent ( read brilliant ) character against all odds. I call myself a recluse given that I have a wide & diverse social circle & friends. I love variety of music and Not many friends know that I used to sing and play Muscial Instruments during school and college. I am in awe of magnificent Mountains and go for adventurous trekking trips to Himalayas. Name the book you read recently and why do you think our readers should check it out. Abhijit Bhaduri’s MBA series. Both books are easy read . Abhijit is a natural storyreller. Do check out both books (Mediocre but Arrogant , Married but available) for humor & wisdom. Moreover, Recent research suggests that reading fiction helps develop Emotional Intelligence Other book I enjoyed is Follow every Rainbow by Rashmi Bansal . It is a book about Women Entrepreneurs. You can read my review of the book here . Name your favorite gadget that you can’t live without. What do you love & hate about HR. The fact that HR involves working with People for People , understanding human psychology and behavior at individual , team, unit, department & organizational level, creating culture, developing Leaders, Learning & Development, Organizational Development . Now Learning about Employer Branding too ~ I just love every aspect of HR. HR seat at the table is one cliche which is overused. Bottom line is ~ HR already has a seat at the table. HR is rightly positioned in the organization to Demonstrate Leadership and not only continue to have seat at the table but make that seat a very sought after one in the organization. HR members play a strategic role in organizations. Finally, Why our readers should read what you write here. Hopefully your readers would love to know how work gets done across borders seamlessly in a globally integrated enterprise. Why Telecommuting is the Future of work and how one can stay visible, effective and productive as a Telecommuter without compromising on Lifestyle choices. Stay tuned to read from her!